Small plastic fragments that have accumulated in the marine environment following decades of pollution can cause significant issues for marine organisms that ingest them, including inflammation, reduced feeding and weight-loss. A new study sheds light on the magnitude of microplastic pollution in our oceans. The study, published today in open-access journal Frontiers in Marine Science, found microplastics in the stomachs of nearly three out of every four mesopelagic fish caught in the Northwest Atlantic — one of the highest levels globally. These findings are worrying, as the affected fish could spread microplastics throughout the ocean. The fish are also prey for fish eaten by humans, meaning that microplastics could indirectly contaminate our food supply through the transfer of associated microplastic toxins. Mesopelagic fish serve as a food source for a large variety of marine animals, including tuna, swordfish, dolphins, seals and sea birds. Typically living at depths of 200-1,000 meters, these fish swim to the surface at night to feed then return to deeper waters during the day. Through these vertical movements, mesopelagic fish play a key role in the cycling of carbon and nutrients from the surface to the deep sea — a process known as biogeochemical cycling. This means they could spread microplastic pollution throughout the marine ecosystem, by carrying microplastics from the surface down to deeper waters, affecting deep-sea organisms. “These fish inhabit a remote area, so theoretically they should be pretty isolated from human influences, such as microplastics. However, as they regularly migrate to the surface, we thought that they may ingest microplastics there,” explains Wieczorek. The researchers plan further studies to learn more about how these fish are ingesting and spreading microplastics. “It will be particularly interesting to see whether the fish ingest these microplastics directly as mistaken prey items, or whether they ingest them through eating prey species, which have previously ingested the microplastics,” says Wieczorek. While studying the ocean floor off California’s Channel Islands, researchers found this mysterious species. While researching previously unmapped regions of the Channel Islands off the California coast, the research vessel Nautilus came across an unusual purple mass peeking out of a coral crevice. As the scientists zoomed in on the beautiful creature, they began wondering aloud what it could possibly be. After guesses of everything from a species of plankton to a colorful egg sack, the team decided to use their deep sea rover’s vacuum tube to grab the mystery species and bring it to the surface. Nudibranchs are a group of soft-shelled mollusk comprised of some 2,300 species and noted for their varied and striking colors. They can be found at nearly all depths and feature chemical defenses that make their bodies both distasteful to predators and, in the case of the acid-secreting variety, painful. 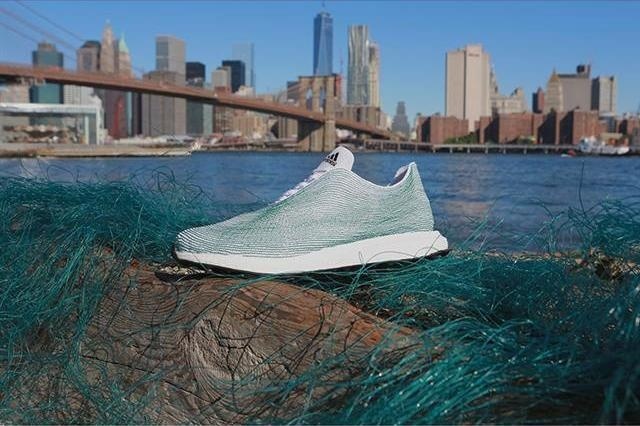 Adidas has just made a pair of sneakers using ocean-recovered garbage. If you didn’t already know it, the oceans are indeed teeming with trash. Everything from consumer plastics to paper to discarded fishing gear litters the seas, polluting the water and threatening wildlife. Adidas is hoping that its new kicks, unveiled earlier this month, will help to highlight the ocean-based environmental issue and promote efforts to get on top of it. The concept shoe is the result of a collaboration between the German sportswear company and Parley for the Oceans, a New York-based ocean conservation group. According to Adidas, the unique shoe upper is made “entirely of yarns and filaments reclaimed and recycled from ocean waste.” It’s actually knitted using a method Adidas has been developing for a while and that’s already led to a range of lightweight Primeknit footwear from the company. The ocean there is thought to extend to 10 times the depth of Earth’s oceans. A salty ocean is lurking beneath the surface of Jupiter’s largest moon, Ganymede, scientists using the Hubble Space Telescope have found. The ocean on Ganymede—which is buried under a thick crust of ice—could actually harbor more water than all of Earth’s surface water combined, according to NASA officials. Scientists think the ocean is about 60 miles (100 kilometers) thick, 10 times the depth of Earth’s oceans, NASA added. The new Hubble Space Telescope finding could also help scientists learn more about the plethora of potentially watery worlds that exist in the solar system and beyond. “The solar system is now looking like a pretty soggy place,” said Jim Green, NASA’s director of planetary science. Scientists are particularly interested in learning more about watery worlds because life as we know it depends on water to thrive. Scientists have also found that Ganymede’s surface shows signs of flooding. Young parts of Ganymede seen in a video map may have been formed by water bubbling up from the interior of the moon through faults or cryo-volcanos at some point in the moon’s history, Green said. Scientists have long suspected that there was an ocean of liquid water on Ganymede—the largest moon in the solar system, at about 3,273 miles (5,268 kilometers) across—has an ocean of liquid water beneath its surface. The Galileo probe measured Ganymede’s magnetic field in 2002, providing some data supporting the theory that the moon has an ocean. The newly announced evidence from the Hubble telescope is the most convincing data supporting the subsurface ocean theory yet, according to NASA. Scientists used Hubble to monitor Ganymede’s auroras, ribbons of light at the poles created by the moon’s magnetic field. The moon’s auroras are also affected by Jupiter’s magnetic field because of the moon’s proximity to the huge planet. When Jupiter’s magnetic field changes, so does Ganymede’s. Researchers were able to watch the two auroras “rock” back and forth with Hubble. Ganymede’s aurora didn’t rock as much as expected, so by monitoring that motion, the researchers concluded that a subsurface ocean was likely responsible for dampening the change in Ganymede’s aurora created by Jupiter. Jupiter’s moons are popular targets for future space missions. The European Space Agency is planning to send a probe called JUICE—short for JUpiter ICy moons Explorer—to Jupiter and its moons in 2022. JUICE is expected to check out Europa, Callisto and Ganymede during its mission. NASA also has its eye on the Jupiter system. Officials are hoping to send a probe to Europa by the mid-2020s. NASA will also celebrate the Hubble telescope’s 25th anniversary this year.